Are we there yet?! We recently made the brave decision to take our first ever 10 hour drive from Sydney to the Gold Coast for our family holiday. We decided to leave at 3am to make some ground while the girls slept – secret Mum hack there if you’re ever doing a long drive with kids! I made sure I packed lots of entertainment for them for when they woke up, as I knew they’d be a bit, disorientated. Luckily the excitement of holiday seemed to keep them going most of the way. What’s a road trip without snacks? Hell – that’s what! I was sure to pack their fave easy-to-eat snacks for when hunger struck, and it saved us loads of money too as we didn’t need to buy expensive food and drink from roadside servos. Full little tummies make an easier ride for everyone. We popped the girls in the car in their Ergo Pouch PJs during car trip – much easier than waking them to get dressed haha Mum hack number 2! It’s a 1.0 TOG sleep suit bag, perfect for mild or warm weather. it converts from sleeping suit bag to a suit with legs (so cute!) so it was great to transition from car to servo and back! Made from 100% organic cotton, you can grab yours here for $74.95 (RRP). 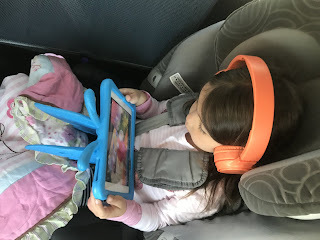 Both girls brought their tablets and we loaded heaps of their favourite movies and YouTube videos – such a great idea for long car journeys. I do usually try to limit the girls’ screen time but at times like that it’s really a case of making it easier for everyone. We don’t do long journeys often, so once in a while I let them loose. It kept them happy and calm in the back and allowed me and hubby to focus on the driving. Boy were these lifesavers!? We used Laser Laser Bluetooth Headphones (RRP $29.95 available from BIG W). These were great for streaming music or watching movies in the car, which meant we didn’t drive ourselves insane listening to the same kids tunes on repeat! The foam ear cups can deliver comfortable listening for up to 12 hours with one charge, and built-in Bluetooth 2.1 delivers stereo sound, and they’re rechargeable via micro USB. As a little roadtrip treat, I got them both a personalised library type bag with zipper from a little Insta page I found called @while.they.napped. This mumma is has 5 kids, works and does her little side business while her kids sleep – hence the name. 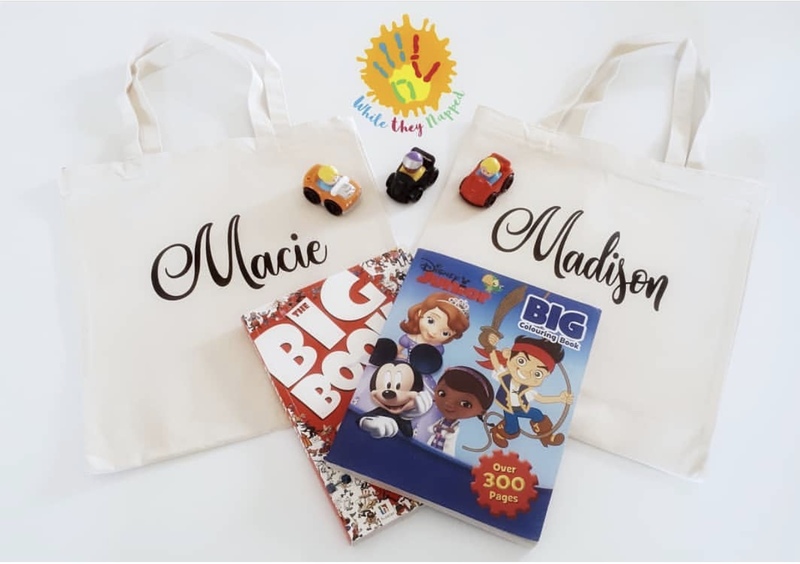 Check out her Facebook page for all her personalised goodies. Oh my gosh – they loved it! I hid them in their packing cases before we left, and they were so excited when they discovered their little surprise. They’re getting to that age where they just want to be super independent, so I got them their own wheelie luggage bags from Penny Scallan Design to let them have their own little moment of grown up-hood. 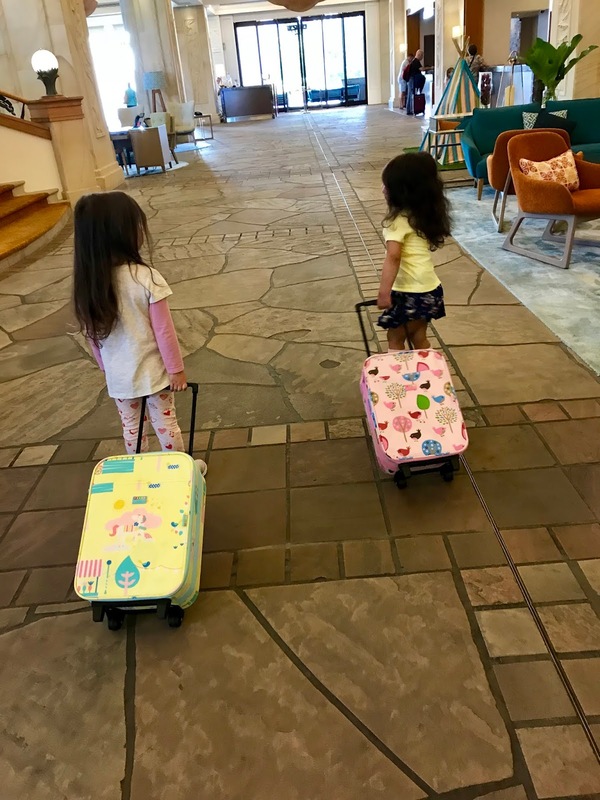 They’re just $69 and were able to fit all their clothes for the full week, plus the goodie bags and a small toy. Their water-resistant coating was easy to wipe clean, too. A great little speaker for the kids, the Ultra-Portable LED Bluetooth Speaker from Laser was super handy for our trip. At just $10 from Big W, I’m so glad I picked this up. It was great at the beach when we wanted to relax and they were full of beans! A few tunes from the speaker and they were dancing around in the sand having the best time! We don’t usually have a sun shade as we don’t drive too far, but we got the Dreambaby EXTRA WIDE CAR WINDOW SHADE 2-PACK for $24.95 and oh my gosh it was really handy to have. They unroll to an adjustable 50cm and easily attach to the windows. It was so handy to be able to stop the car getting too hot. The kids always whine when it’s too stuffy so that definitely saved us a few tantrums! To protect the girls from the sun outside of the car I got them both a bucket hat from an Insta page I found called Bedhead Hats They’re UPF 50+ and have so many cute designs – shop the range Being sun safe was super important as the weather on the Goldie was getting pretty hot. After many stops to stretch our legs and empty little bladders, we finally arrived on the Gold Coast. Phew! It was tiring and definitely a challenge but overall it was a nice family experience. The kids loved it, actually. Once we’d arrived, it was straight into the activities! What’s a trip to the Gold Coast without theme parks!? 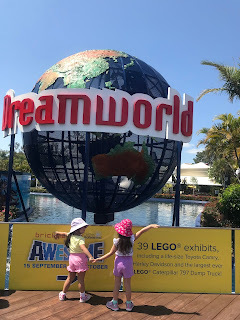 We went to Movie World, Sea World and Dreamworld and the girls just loved it – and Mum and Dad didn’t mind it either haha. We love Wonder Woman, so it was so fun seeing her in the Street Parade. We got a Bugs Bunny trophy as a souvenir, had the yummiest buffet lunch, and the girls got to drive a mini race car, so it was a good day for everyone. Somehow we got Madison on her first ever roller coaster! She was nervous but mostly so excited, bless her. We saw the dolphins which the girls just loved, and the gorgeous illuminated sea jellies were our highlight. We got to see loads of animals that the girls had never seen before, too, so being able to watch them see new things was so special. Polar bears and sharks were definitely highlights. Scary highlights, but fun all the same! 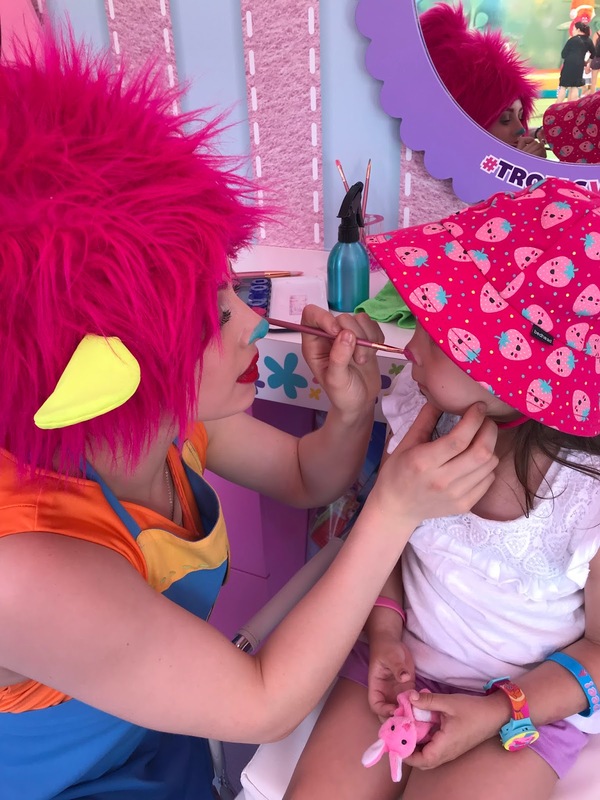 The girls are big Trolls fans, so we were pretty excited to show them the Trolls Village! They were able to get ‘Trolled up’ in the little salon, and have a full Troll makeover. First, you get a lucky bracelet, then you get a Poppy hug time watch, followed by Poppy makeup and finally the Poppy hair! 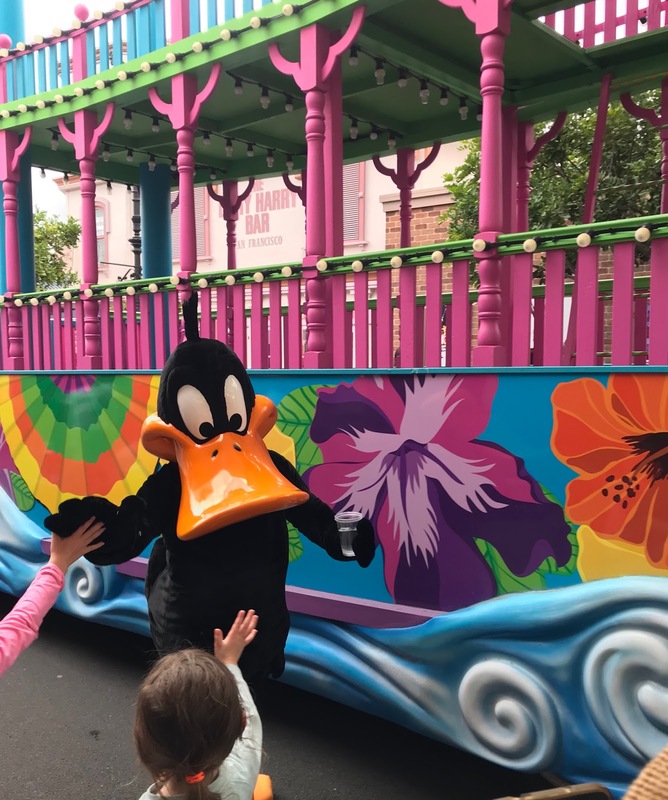 Once you see yourself all ‘Trolled up’ you can take a picture with the characters – wow the girls just loved it! Trolls aside, the girls got to explore the Lego store, spot tigers and go on some family friendly rides. So that’s it guys! Our first family holiday to the Gold Coast – by car! We had a great time, lots of pool days, the nicest food, and this Mumma didn’t have to cook or clean or 7 days – ultimate bonus. Have you road-tripped or holidayed with kids?! Share your tips with me! I love the idea of the kids goodie bags! Glad you had an amazing trip! It sounds like an amazing trip, and you did so well with the road trip prep! What a fun trip!! You were so prepared too! We are doing the drive up to QLD at the end of the year and I am not looking forward it at all haha will be nice once we get there though! That is a crazy long car trip especially with two little girls - I'm so impresssed!